It is not only in Munich that the Chinese are active; it is the world over. Spying is only one of the aspects of the Embassies' activities. With its economic power (not yet super), China has other ways to influence 'thinkers', 'scholars' and others leaders. A few ago, Ramananda Sengyota wrote in Rediff.com an edifying article: Chinese 'gifts' worry India. This is going on full swing today. Munich investigators on Tuesday searched the apartments of four alleged Chinese agents on suspicion they have been spying on the city's Uighur community, news magazine Der Spiegel reported. Authorities told the magazine that the Chinese general consulate has been running a spy network from the Bavarian capital, where several hundred Muslim Uighurs form one of the largest communities outside of China. The World Uighur Congress is also located in the city, and many members are politically active in protesting what they see as China's oppression of the ethnic group. Meanwhile China has in the past accused Uighur exile groups of supporting terrorism. “According to findings by the Federal Public Prosecutor’s office, the Chinese government has therefore won a range of informants who report on the private lives of the Munich Uighur community for Beijing,” the magazine's website said. Investigators have observed Chinese diplomats meeting with the informants, but only the alleged spies are under investigation due to matters of diplomatic immunity. The efforts by German authorities are the result of new policies created last year to curtail possible Chinese espionage, though this is the first time they have taken such drastic steps, the magazine said. Two years ago Chinese diplomat Ji Wumin left Germany after he was discovered meeting with an informant about Uighur issues. But he departed of his own accord without being expelled. China is said to be interested in returning Ji to his former post, but this is now unlikely after the latest raids, which are related to his successor, the magazine said. An email received from a friend in UK makes an important point. The Tibetans in exile are rightly grateful to the Central and States governments which welcomed and supported them for the past fifty years. India also gave them the freedom to practice their religion and preserve their culture. A beautiful song has been written by the Tibetan Institute of Performing Arts (lyrics Thubten Jinpa) for the occasion. I have read your article Sun Shines in Tawang. It is good news indeed when Delhi has stayed firm when His Holiness the Dalai Lama visited Arunachal Pradesh . I always appreciate how you bring the accurate details of history into the present as you know. I heard about the festival in Sikkim as the Rinpoche I am in contact with, gave the " thank you speech " for the Tibetan people and the ministers who were present. And for this reason I thought it was a pity that in your article you did not mention the objective of this festival was to thank Sikkim for all its help to enable the Tibetans to continue to flourish. This is a moment of gratitude for fifty years of what would have been homelessness and deprivation as we witnessed with boat people of Vietnam arriving on foreign shores.. Rarely across the world, ( can you remember any other instances ) do we hear any people expressing gratitude for providing a home when faced with exile. I believe it is a marvellous example of what we all can learn to do so much better, to give thanks for those who provide anything that can help anyone. So many articles celebrate the resilience of the Tibetan people and HH the Dalai Lama in the face of Chinese exile, yet this is one moment when humility and appreciation to the host country is provided as an offering to illustrate the value of what has continued to thrive with the help of others. This, from what I understand, was the overarchining motivation for the festival of Tibetan culture in Sikkim, to celebrate the thankfulness to those who enabled the culture to survive. For without this kindness of the host country, the living Tibetan culture, as we have come to know, might have perished. There is a time and place for everything and I believe it is important part of history to report that moment when the Tibetan People say "Thank you" from the bottom of their hearts. The Chinese can hardly get angry with India and Sikkim for accepting a "thank you" for the Tibetans. This is one way maybe the Chinese learn the lessons of vipasana and equanimity from real Buddhist teachers. My new book has been released by Lancer Publishers. In October 1950, Communist China invaded Tibet. After nine years of difficult co-habitation with the occupiers, the Dalai Lama, the young temporal and spiritual leader of the Tibetans, had no choice but to flee his country to take refuge in India. It took 20 years for the Tibetans to renew a dialogue with the leaders in Beijing. Soon after Deng Xiaoping’s return to power in 1978, the first contacts were made. Using rare documents, this is the story of thirty years of encounters between the Tibetan Administration in Dharamsala and Beijing. Today the stalemate continues; Beijing refuses to offer any sort of concession to the Dalai Lama’s demand for a genuine autonomy for Tibet. Just like the border ‘talks’ between India and China, the negotiations with Dharamsala have never really started. Reading through this book one understands how the relations between India and China are inextricably linked to the status of Tibet. Further, the present unrest in Tibet renders China unstable and increasingly belligerent towards India which gave refuge to the Tibetans. Why don't he stay in China? He could be sent by Beijing to Xinjiang to preach there. It will not be a loss for India and the J&K State. 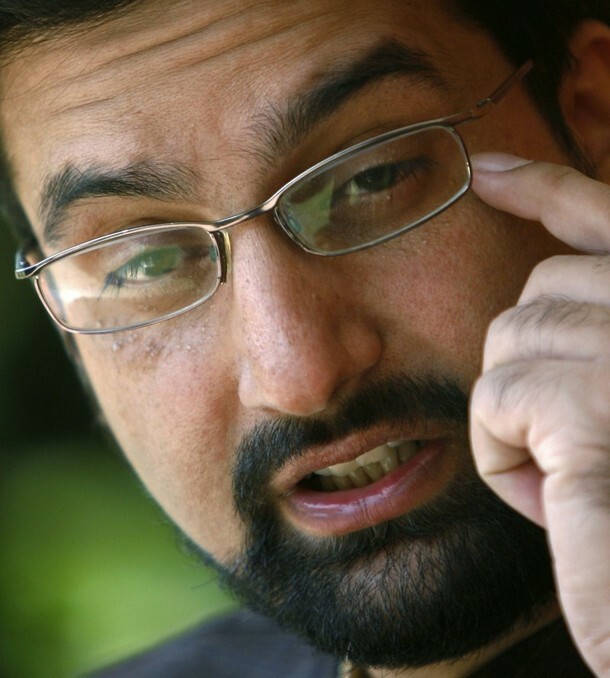 Beijing, Nov 23 (PTI) China's invitation to Hurriyat leader Mirwaiz Umar Farooq for a visit is "unrelated" to India allowing the Dalai Lama to tour Arunachal Pradesh, Chinese scholars said today as they asserted that Beijing was "not that petty-minded to take revenge." Chinese experts, quoted by People's Daily, the mouthpiece of the ruling Communist Party say China as well as its affiliate Global Times, say China is not interfering in the dispute over Kashmir between India and Pakistan despite Beijing's invitation to the Mirwaiz. Farooq's expected visit to China comes after the Dalai Lama toured Arunachal Pradesh, the northeastern state which Beijing says is disputed. The reports noted that there is speculation that China's move to invite the Mirwaiz is "a counter-measure" by Beijing. My assessment of Tawang's visit has been published in The Pioneer. Click here to read. Despite Chinese protests, the Government of India cleared the Dalai Lama’s visit to Tawang allowing him to journey to Arunachal. What lessons can we draw from this event which has been extensively covered by the national media? The first message is that, though it has ‘upset’ the Chinese, nothing dramatic happened. Most of the so-called Indian experts who are regularly taken for lavish trips to China had prophesized that Hell would break loose if the Dalai Lama were permitted to go to Tawang; it has not been the case. For India, it has been an occasion to discover that even if the Chinese are ‘upset’, it is not the end of the world. This has apparently percolated the Government’s psyche; the media and the general public are also gradually becoming aware of it. Till recently, if India opened an airport or had to send troops to its northern frontier or if the Prime Minister had to visit Arunachal, the Chinese would inevitably be ‘upset’. But if India dared to say anything about an infrastructure project in Tibet or about Beijing’s plans to built huge dams on the Brahmaputra, the Chinese spokesman would immediately forcefully state, “Please, it is our internal affair, don’t interfere”. This is called double standards. It seems to me that this constant rage is not healthy; the Chinese leadership has a serious problem. Could someone suggest to them to take some lessons in vipasana and equanimity from a Buddhist teacher? While it is good that India always keeps her proverbial cool and practices samata, usually at the end of the day, the Ministry vacillates under Chinese pressure. This time, it remained firm; it did not budge under the veiled threats or melt under sweet smiles. Unyielding under the pressure, Delhi has reiterated its decade-old position on the border. It was already enunciated in 1959 by Nehru, India’s first Prime Minister in a letter to Zhou Enlai, his Chinese counterpart. It may seems strange today (particularly after the pre-visit noise from Beijing), but Zhou Enlai had told Nehru in 1957 that he had no objection to the McMahon Line (he just did not like the British connotation of the name), but that the Tibetans were unhappy about it). 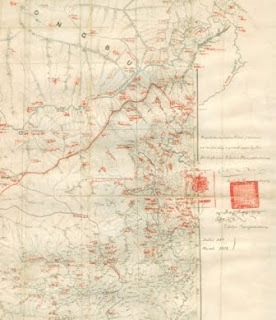 It is much later that the Chinese, wanting a bargaining chip to legalize their occupation of the Aksai Chin, decided to play the ‘Tawang card’ and started clamouring about Arunachal. For a time, they even argued that the local Arunachal residents did not need Chinese visas to ‘visit their own motherland’. By allowing the Dalai Lama to visit Tawang, Delhi has made clear its position on the border. It will be greatly helpful when the Special Representatives MK Narayanan and his Chinese counterpart Dai Bingguo meet the next time. People not only from the North-East, but also from Ladakh, Lahaul, Spiti, Kinnaur or Sikkim often feel (rightly or wrongly) that they are second class citizens in India. This sentiment has been prevailing for a long time and is accentuated by Delhi-centered policies which have often ignored the feeling of these populations. By agreeing to let the Tibetan leader visit Arunachal Pradesh, the Manmohan Singh Government has offered a wonderful gift to the local people. Can you imagine the entire population of a district stopping all activities for four days to listen to a leader preaching the tenets of their own culture? The Dalai Lama’s words resonated in the ears of each man or woman who had come to hear the spiritual leader speaking about their Buddhist roots. Chinese always speak of ‘the masses’, but has the totalitarian regime in Beijing the faintest idea of what ‘masses’ mean? Unfortunately for Beijing’s lame arguments, the masses have shown where their hearts turn for solace and advice. While the Indian media was busy covering the Dalai Lama's visit to Tawang, not far away, in Gangtok several Tibetan and Sikkimese NGOs organized a Tibet Festival. Incredible crowds thronged the venue. The opening ceremony was attended by no less than three ministers of the Chamling Government and on the last day, it is the Chief Minister himself who declared the Festival closed. While Tibetan culture is being erased in Tibet, the Cultural Renaissance in the Himalayan Belt is a fact. It is mainly due to the presence of the Dalai Lama in India who for the past 50 years has been teaching tolerance and non-violence. One can imagine what would happen if the Dalai Lama was allowed to cross the McMahon Line and visit his native land. It is a great Indian quality to be able to never worry. Even if the IAF had only 10 Mig21 left, they would declare: "Don't worry, the Truth is on our side". 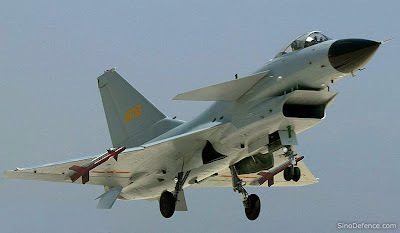 Unperturbed by reports about China selling 36 advanced fighter jets to Pakistan or its plans to launch an intelligence satellite, the Indian Air Force on Friday said there was 'nothing to worry' as Indian armed forces were capable of protecting the country's interest. "Do not worry and do not make people worry. Our country is strong enough. Our Army, Navy and Air Force are capable of looking after the interest of our country," IAF Chief P V Naik told reporters in New Delhi on Friday. He was responding to queries about whether reports about China selling J-10 fighter jets to Pakistan, and their plans to launch an intelligence satellite, were a cause of worry for India. "When a sovereign country interacts with another country, there is no issue over selling weapons. It is up to them," he said on the fighter jet sales. Air Chief Marshal Naik said several countries had intelligence satellites and there were several types of satellites in space today. "However, we have stated that we are not for militarisation of space and the entire world has said that it is not for militarisation of space," he said. "What has China been doing? We have nothing to do about it. It is their problem. Let them do anything. Do not worry, we are capable of taking care of the country," he added. 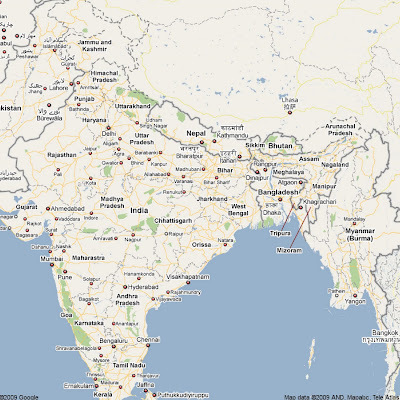 Two Google maps of India. 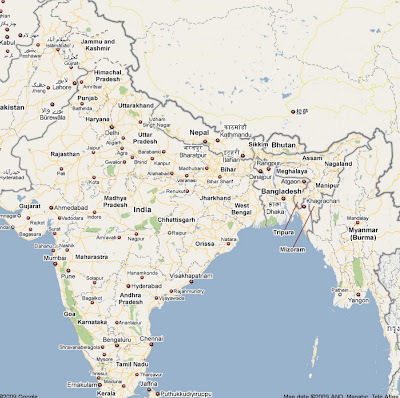 The first one accessible from India shows Arunachal and Aksai Chin as disputed territories and the second for the Chinese googlers, with the entire Arunachal and Aksai Chin belonging to China. While the Indian media was busy covering the Dalai Lama's visit to Tawang, several Tibetan and Sikkimese NGOs and the Government of Sikkim organized a Tibet Festival in Gangtok. Crowds thronged the venue. The opening ceremony was attended by no less than three ministers of the Chamling Government and on the last day, it is the Chief Minister himself who declared the Festival closed. Apart from the exhibition, a dense program of lectures, religious discourses, panel discussions, traditional dances, fashion shows (featuring Miss Tibet!) was offered to the thousands of visitors. Is isn't a strong statement from the people and Government of Sikkim about their age-old relation with Tibet? While the Tibetan culture is being erased in Tibet, the Cultural Renaissance in the Himalayan Belt, whether it is in Tawang, Gangtok, Leh or Spiti is fact. Everybody, including Beijing has to accept that is mainly due to the presence of the Dalai Lama in India for the past 50 years. NINE FM and the Tibetans of Sikkim presented the 'TIBET FESTIVAL' to exhibit the spirit of Tibet in its original form. Siliguri, West Bengal, November 11, 2009 /India PRwire/ -- The state of Sikkim is home to a multitude of communities - Lepcha, Bhutia, Nepali, Tibetans, Limboos and many more. Each community resides peacefully as a whole and they are free to express and celebrate their mirth without any inhibitions. NINE FM and the Tibetans of Sikkim presented the 'TIBET FESTIVAL' to mark their presence in the state and to open new avenues of learning to the people who are ignorant of the Tibetan Culture. The Tibet festival was held at Kanchenjunga Shopping Complex, Gangtok from November 6 to 10, 2009 to coincide with the 50 years of the Tibetan people's life in exile and to express their gratitude to the state government and the people of Sikkim. Lectures and exhibits on Tibet's Cultural Heritage, Buddhism, Tibetan medicine, astrology, traditional music and dance, costumes, crafts, and cuisine was showcased at the festival. The festival showcased the rich cultural identity of Tibet that has been conserved for the past 50 years in exile with kind assistance from the Indian government and its people. It also exhibited the spirit of Tibet in its original form. On this auspicious festival, His Holiness the Dalai Lama had sent his greetings to the first ever Tibet Festival which was read out at the opening function of the festival. T.T. Bhutia, the Minister of Transport & Public Health Engineering, presided over as the chief guest for the inaugural function. When it comes to promoting culture and 'oneness' NINE on 91.9FM has always been an enthusiastic medium of promotion which is why NINE FM,Gangtok was the official radio partner of the Tibet Festival. NINE on 91.9FM, Gangtok covered the entire event on-air. Live links from the venue was aired. Playing the role of the official radio partner NINE FM, Gangtok invited the people to come forward and be a part of the festival. NINE FM also aired messages on the importance of preserving one's rich cultural heritage. Speaking of the festival, Mr. Bobby Gupta, Chief Executive, NINE FM said, "It is indeed an honor to be a part of the Tibet Festival. The best way to preserve our cultural heritage, whatever it may be, is to share it with others. Sharing our cultural heritage helps to enrich the lives of others through the gift of discovering diversity. There are several ways we can accomplish this and TIBET FESTIVAL is one such initiative." Why is the Dalai Lama going to Tawang? Another article on the Tawang's visit, this time in Rediff.com. My article on the Dalai Lama's visit to Tawang has been published in The New Indian Express under the title The Dalai Lama Question.Click here t o read. Is France protecting Chinese interests? If you read these two articles together, it seems that France (like the US) is protecting the corrupt Karzai government ....and the Chinese interests. 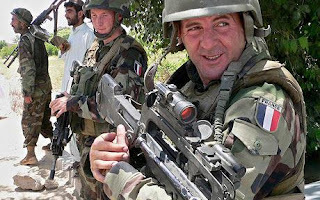 It is just sad for the young French jawans who die in Afghanistan. President Nicolas Sarkozy Tuesday assured Hamid Karzai of France's "full backing" as he congratulated the Afghan leader on his re-election. "You have managed since the first round to get the most support from the Afghan people," Sarkozy said in a letter released by his office. "You must move forward..." he said, adding: "France will remain at the side of the Afghan people as long as necessary... I assure you of the full backing of France to the efforts that your government and you are undertaking." At a former al-Qaida stronghold southeast of the Afghan capital, a state-owned Chinese company is at work on a $3 billion mine project to tap one of the world's largest unexploited copper reserves, a potential financial boon for an impoverished country mired in war. The promise of a bright future at Aynak, however, cannot conceal the troubling reality of how business is often done in Afghanistan, according to critics of the Kabul government's decision to reject bids from competitors in the U.S., Canada and other countries. Corruption and graft long have been ingrained in Afghanistan's public institutions. Yet the extent of this corrosion has taken on new significance as the White House considers expanding the U.S. commitment to a war unsupported by a growing number of Americans. Widespread fraud in Afghanistan's presidential election in August has raised doubts about how quickly a stable and credible government can be installed. A U.N.-backed commission threw out nearly one-third of President Hamid Karzai's votes, setting the stage for a Nov. 7 runoff. In his recent assessment of the situation in Afghanistan, the top U.S. commander warned that unchecked corruption has led alienated Afghans to support the Taliban-led insurgency. Afghan officials insist the Aynak bidding was handled openly and honestly, and will create thousands of jobs. But several U.S. geologists and Western businessmen who watched the process closely disagree. James Yeager, an American geologist who advised Afghanistan's minister of mines, says a few Afghan officials dominated a secretive selection process that gave the winner, China Metallurgical Group Corp., improbably high marks over its foreign competitors. Said Tayeb Jawad, Afghanistan's ambassador to the United States, said the bidding process was above board. He said he pushed for the U.S. bidder, Phelps Dodge, to be awarded the Aynak rights, but that China offered to start work right away while Phelps wanted to wait until the country was safer. "We can't afford to give the mining rights to a company that will sit on them for the next 10 or 15 years," Jawad said. China Metallurgical, better known as MCC, has a poor track record with mining projects in other countries, according to Yeager and other critics. In neighboring Pakistan, for example, where MCC operates a copper mine, there's been little benefit to the local economy. But that information was ignored during the deliberations, they say. MCC did not immediately respond to questions submitted by e-mail, as the company requested, about whether MCC received special treatment from the Afghan government on the Aynak bidding process; whether it was allowed to see copies of other bids, as at least one competitor alleges; or whether the Pakistan mine has failed to help the local economy. The Aynak deal was awarded to the Chinese late 2007, but the project is only now getting under way. Before copper can be hauled from the ground, China must make a substantial investment to build a power-generating station, roads and a railway to move the metal. Yeager and Larry Snee, a former U.S. Geological Survey official who also has worked in Afghanistan, contend that MCC probably will steer most of the jobs to Chinese workers. "Of course, the Afghans are going to benefit," Snee said. "But will they get all they deserve?" China needs huge quantities of raw materials to feed its rapid economic growth and energy demands. It is well positioned to become the dominant force in Afghanistan's potentially lucrative minerals sector, said Don Ritter, president of the Afghan-American Chamber of Commerce in McLean, Va.
"In what direction do (Afghanistan's) mines and minerals develop?" Ritter said. "Do they go the Eastern model, where everything is done behind a closed door? Or, is there an open, transparent competition, where the money is laid on the table without undue influence?" Yeager has distributed a 78-page report on the Aynak contract in which he contends that M. Ibrahim Adel, Afghanistan's minister of mines, and his associates shut out legal, financial and technical experts who could have helped them on the decision. Yeager doesn't accuse Adel or anyone else from benefiting personally by awarding the work to MCC. But the final decision, Yeager says, was dictated by bureaucrats concerned with dollar amounts and personal preferences. One of the losing competitors for the contract was Hunter Dickinson, a global mining company based in Vancouver, Canada. Robert Schafer, Hunter Dickinson's chief of business development, said an Afghan official told him that its bid had been shown to the Chinese while the proposals were being evaluated. Schafer said he "wasn't surprised at all" to learn that MCC won. Wang Baodong, a spokesman for the Chinese Embassy in Washington, did not address the allegations. He said China is committed to pursuing economic, trade and investment projects in Afghanistan that benefit both countries. China has contributed little to improving security in Afghanistan, yet with the Aynak deal, stands to gain from the sacrifices made by the U.S. and NATO in troops and money. "The world isn't fair," said Robert Kaplan, a senior fellow at the Center for a New American Security in Washington. "A worse outcome to staying and helping the Chinese would be withdrawing and losing a great battle in the war against radical Islam." Many thanks for your letter of the 23rd January which I have read with the care and attention which it deserves. The Dalai Lama is arriving soon in the North-eastern State of Arunachal Pradesh for a week-long visit. There are different views on the Dalai Lama’s trip to the State. In a previous article, I explained why the Chinese are so upset (or pretend to be upset) about the Tibetan leader’s visit to Arunachal and Tawang. Beijing claims the entire State of Arunachal Pradesh as theirs. Though they offer various clumsy historical justifications for it, Beijing’s main reason remains that it is not ready to accept that Tibet was once an independent nation (and therefore the McMahon Line has some validity). This mindset has not changed much in the Middle Kingdom. One of the consequences of this way of thinking is that the present leadership in Beijing is unable to grasp the motivations of the leader of the Tibetans. This creates unnecessary misunderstandings. His first commitment remains towards humanity, what he calls “the promotion of human values such as compassion, forgiveness, tolerance, contentment and self-discipline. All human beings are the same. We all want happiness and do not want suffering.” He terms this ‘secular ethics’. If all the religious teachers spoke thus, many of the world problems would be solved. It sometimes irritates some of his young countrymen, but his commitment to his native land and his people comes only third. Among other reasons, this makes the Dalai Lama a special person, a leader of humanity, respected worldwide (including by many in China). The Dalai Lama adds: “Out of three commitments, number one and two are mostly on volunteer basis. Till my death I committed myself to these causes. Regarding the third one, in a way it not a voluntary commitment, it is due to past history and to the Dalai Lama institution. I am bound to this commitment and this responsibility, because I am the Dalai Lama who played a role in the past history of Tibet”. 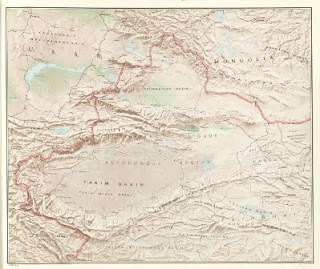 Though the Dalai Lama’s trip to Tawang is not directly connected to his third commitment, it is however a fact that the entire Himalayan belt has culturally been very close to Tibet. Whether Ladakh, Sikkim, Lahoul, Spiti or Monyul (Tawang region), the population of these areas speak a Tibetan dialect; the religion practiced is Tibetan Buddhism; the script used for their religious scriptures is similar to Tibetan; several monasteries in these areas were religiously affiliated to some of the large monasteries on the Roof of the World and finally Tibetan Lamas have always taught the Buddha Dharma in these regions. 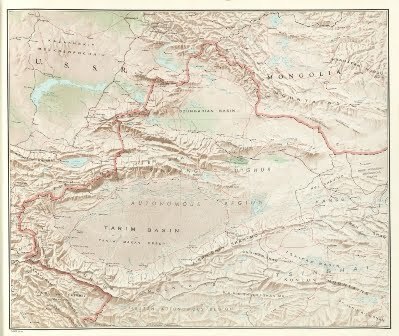 This however does not mean that these areas were part of Tibet. This cultural affinity is one of the reasons why the Dalai Lama has accepted the invitation to visit Tawang. Another fact often ignored is that the impregnable Himalayas, the highest mountain range in the world, have been a quite porous frontier. It is only in the last 50 years, (in fact after 1962 war with China) that the flow of goods and people abruptly stopped. One of the most tragic collaterals of China’s invasion of Tibet in 1950 is that not only border trade, but even cultural and religious exchanges came to an end. For centuries, caravans from Ladakh to Western Tibet, from Kalimpong to Chumbi Valley on the Tibetan side of Natu-la in Sikkim, from Tawang (Arunachal) to Southern Tibet or from Munsyari (Uttarakhand) to the Kailas-Manasarovar region, have visited, traded and had exchanges with the Land of Snows. There was a border (the McMahon Line in the North-East, at Demchog in Ladakh, Shipki-la in Himachal or Lipulekh-la in Uttarakhand, for example), but no human hindrance stopped traders, pilgrims and even government officials to move from one side to the other. When one looks at certain frescos in Western Tibet (Tsaparang/Toling in Ngari district), one is flabbergasted by the resemblance with Ajanta and other Buddhist caves in India. Why? Simply because for centuries, Indian artists travelled freely from India to Tibet and vice-versa. The history of the Himalayan belt is full of stories recounting the arduous trips of men and animals walking across treacherous passes and frosty valleys. Nobody blocked their journey; even though they belonged to different countries, both sides shared a common culture. Another example: when Buddhism nearly disappeared from Tibet during the 9th/10th century AD, the renaissance of the Dharma in the Land of Snows originated from India’s Buddhist regions of Ladakh and Spiti. This is another reason why the Dalai Lama has accepted the invitation to go to Tawang: like Tibet, the eastern part of Arunachal belongs to the Himalayan world. This has nothing to do with an official border. Is the Dalai Lama’s visit political? Beijing is often under the impression the Tibetan leader has a hidden agenda and wants to score points. They probably see the Tawang visit as one such occasion. 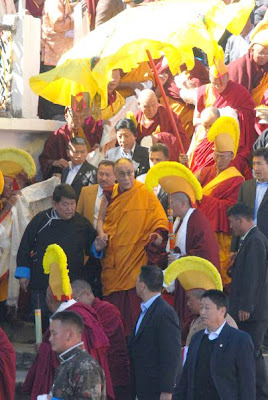 The Dalai Lama’s visit to Tawang clearly relates to his two first commitments, to preach ‘secular ethics’ and, as a Buddhist teacher, to educate his local coreligionists about the importance of adhering to traditional Buddhist values while keeping an open mind about today’s problems (including global warming and environment). 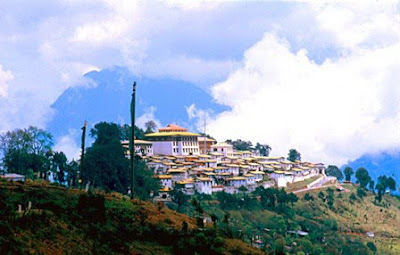 Let us not forget that Tawang monastery is the largest Indian vihara. The Dalai Lama’s fourth visit to this area since his exile, is therefore logical, there is no reason why the Tibetan leader could not teach the Buddha Dharma in this part of India. At the same time, it is clear that the last thing the Dalai Lama would like to do is to embarrass the Indian government. He knows perfectly well how sensitive the situation between India and China has been during the last few months; that is why he will strictly adhere to his two first commitments. The Dalai Lama rightly says: “The Chinese government politicizes too much wherever I go”. And one still wonders why Beijing did not raise a hue and cry on the occasion of the Dalai Lama’s three first visits. His presence in Tawang is nevertheless a silent reiteration that the McMahon Line was (and is) the border between Tibet (today China) and India. My article on Afghanistan Toward Chaoistan published in The Pioneer today. To read, just click. China bullies small and big ones without discrimination. Most of the time, it unfortunately works. After getting Obama to kowtow, they managed to bully the Germans during the Frankfurt Book Fair. With Bangladesh, it was easier. 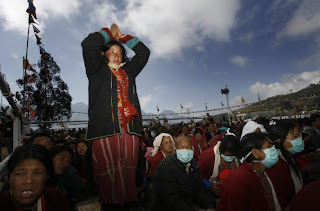 India still resists on the Dalai Lama's visit to Tawang. An exhibition "Into Exile - Tibet 1949 - 2009" featuring the journey of "Tibetans from their Homeland to Exile" has been banned by police on Sunday, organizers said. Bangladeshi police in the country's capital Dhaka on Sunday barred a prominent picture gallery from holding a photo exhibition on Tibet following complaints from Chinese diplomats, the government and organisers have said. Police in riot gear arrived at the Drik Gallery at the capital's posh Dhanmondi area and sealed the place ahead of the ahead of the opening of the exhibition on Sunday evening. However, defying orders from police and requests from Chinese embassy, the organisers staged the exhibition depicting the plight of Tibetans on the street outside the venue. The exhibition "Into Exile | Tibet 1949 - 2009" featuring the journey of "Tibetans from their Homeland to Exile" was organized by the Students for a Free Tibet, Bangladesh (SFTBD)' in partnership with Drik Gallery, and includes some very rare photos of the Dalai Lama's journey into exile in 1959. An hour before the launch, scheduled for 5 pm on Sunday, police shut the gates of the Drik Gallery preventing public from entering the gallery, according to a spokesperson from SFTBD. Drik managing director Dr Shahidul Alam reportedly said Bangladesh Police Special Branch spoke with him and asked him to stop the exhibition citing a "government order". Police also demanded to know the names of the organizers and are said to be looking out for them. The SFTBD spokesperson earlier told Phayul that two Chinese diplomats approached the venue on Friday to request the organizers to stop the exhibition. "After that I also received a series of phone calls from the ministry of cultural affairs and from a number of MPs," bdnews24.com quoted Alam as saying. "On Saturday, officers from the Special Branch of police came and exerted pressure to stop the exhibition according to a 'government order'. I wanted a written copy of the government order but they refused to show me." Alam also said he received a call from MP Hasanul Huq Inu on Saturday at 3:55 PM to remind him that Bangladesh had a One China policy. Officers from Dhanmondi police station have reportedly said the show was closed on directives of the higher authorities as prior permission was not sought for the exhibition. Officials of Drik — a world- renowned photo library, media and communication organisation — said they have arranged countless minor and major exhibitions over the past 20 years and never needed any permission. Organisers say the government is acting purely under Chinese pressure. On Sunday, at 5.44 pm, Professor Muzaffar Ahmed, former chairman of Transparency International Bangladesh and chief guest at the launch, informally inaugurated the exhibition on the street outside Drik Gallery as police continued to block the gates to the premises. Activists were seen demonstrating in support of the show. Protesters held placards reading “Free Tibet” and “Freedom of Expression” slogans to protest the ban. In a short speech, Muzaffar focused on the importance of freedom of expression. "The ideal of one world that the United Nations talk about will only be established when the right to freedom of everybody's expression is protected," bdnews24.com quoted Muzzaffar as saying. My article What India must learn from China is available on Sify.com. Click here.